Academics lay down their gowns during a protest against the dismissal of academics from universities following a post-coup emergency decree, in the Cebeci campus of Ankara University in Turkey, Feb. 10, 2017. Academics and students protested Tuesday outside Istanbul's Marmara University, criticizing the latest wave of firings of scholars under emergency rule. The university saw some of its top staff fired this month, under an emergency decree that removed 330 academics nationwide, along with 4,000 civil servants. Among those dismissed is Marmara University's internationally renowned professor Ibrahim Kaboglu, one of Turkey's foremost constitutional law experts. Since the introduction of emergency rule following July's failed coup, more than 5,000 academics have been purged, accused of supporting terrorist organizations and the failed coup. Riot police detain a demonstrator during a protest against the dismissal of academics from universities following a post-coup emergency decree, outside the Cebeci campus in Ankara, Turkey, Feb. 10, 2017. But this latest wave of removals included many top scholars from Turkey's leading universities, prompting fears about the future of Turkey's higher education. Akca says he, like many of his colleagues, was fired for signing a petition calling for an end to fighting between the Turkish state and Kurdish insurgents. He says the purge is about silencing critical voices. The list of those purged this month reads like a list of who's who in Turkish academia, in such areas as constitutional law, neurology, theater, music and political science. Ankara University, which has for decades educated many of Turkey's political leaders and diplomats, saw dozens of its staff fired. 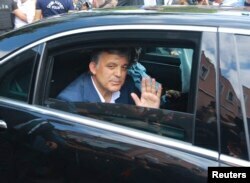 Former Turkish President Abdullah Gul waves as he leaves a memorial service for the victims of the thwarted coup in Istanbul, July 17, 2016. Last week, police violently broke up a protest by academics and students at the university, but unrest is continuing. The latest wave of firings has been strongly condemned by opposition parties. Concern also has been expressed by former President Abdullah Gul, who is a founding member of the ruling AK Party. “Following these events with sorrow, and have seen many instances regarding these dismissed academics that do not sit well with one's conscience, and even less so with justice. The increasing frequency of events like this, particularly in the scholarly world and in universities, is both disturbing and painful,” Gul said speaking to TV reporters. In a rare show of dissent, some in the normally disciplined pro-government media have expressed criticism. These include influential columnists, some of whom condemned many of the firings outright. Prime Minister Binali Yildirim addresses members of parliament at the Turkish parliament in Ankara, Nov. 8, 2016. 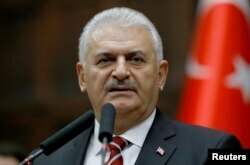 Sensing growing unease, Prime Minister Binali Yildirim sought Tuesday to allay concerns, in his weekly address to his parliamentary deputies. “In order to find a judicial remedy for any injustices, if there are any, we have formed a re-evaluation mechanism regarding the latest decree. This committee will consist of seven members, who will examine all the objections and then make a decision,” said Yildirim. Critics already have condemned the move, claiming it undermines a fundamental principle of innocence until proven guilty. The independence of those on the committee also has been questioned. Unrest is reportedly spreading to universities across the country, with students boycotting classes and holding protests. That will most likely continue, with analysts warning further purges are likely. For students and academics at Marmara University, there is defiance and foreboding, “We could be pessimistic but we are trying not to be, for continuing our struggle,” said a defiant film student who did not want to give his name for fear of retribution.